It’s that time of the year again when summer has now officially passed into fall and the leaves on the trees will begin turning into their brightly-hued colors of red, orange, and gold. It’s also a time when people start turning to the great outdoors as the weather is starting to cool a little and making time for campfires, hayrides, and all sorts of great activities. One of those greatest of outdoor activities in the fall is the onset of football season. What better time to be outside than to go to a local high school football game on a Friday night or a Saturday afternoon game on a college campus nearby. The pageantry of many of these games is a sight to behold especially if you live in the South. They are known for the festive atmosphere of tailgating before, during and after the game. Many sports fans go to a great deal of trouble to prepare a repast of food that is second-to-none. I personally have never participated in a full-on tailgating experience, mainly because to me it takes a little too much time and prep, but I would be remiss to say that there are times I am envious of what they are eating. For those that truly like to get into the experience and want to enjoy the entire day to its fullest, I have some ideas on how to make the best tailgating experience possible. 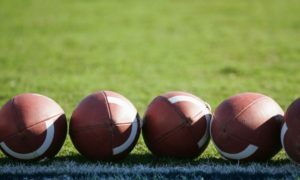 Here at the Daviess County Public Library, we have a variety of books on football as a sport, tailgating eats and treats, and the wonderful sights and sounds of autumn in general. The Perfect PassAmerican Genius and the Reinvention of Football By Gwynne, S. C.
Billion-dollar BallA Journey Through the Big-money Culture of College Football By Gaul, Gilbert M.
Good Housekeeping the Great Potluck CookbookOur Favorite Recipes for Carry-in Suppers, Brunch Buffets, Tailgate Parties & More! As you can see, the library has several different books to suit your needs in this area. However, I personally would delve a little deeper into magazines and other venues too. We carry Southern Living magazine, which always has a section in the September/October issues on fall foods and tailgating. Additionally, you can always go online to the Southern Living website and they will most assuredly have even more to choose from.